Extremely easy and tough plant. Recommended for naturalizing difficult areas. Prolific self sower. This wild version of the shasta daisy is among the toughest and least demanding of the plants I grow. The flowers are similar to shastas, with yellow centers and white petals, but slightly smaller. They appear in early summer on 20 to 30 inch stems and make excellent cut flowers (I find that they last longer than the regular shastas). 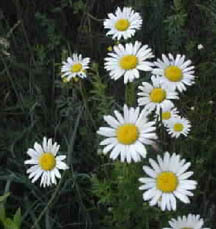 Wild daisy will grow in full sun or light shade and will tolerate just about any soil short of swampy. They will compete with most other plants and self sow quite readily. For these reasons, it may not be a good choice for a mixed border unless you are diligent about keeping them in check. They are great for wildflower gardens and naturalizing tough spots. I have them growing in a hillside garden that has poor, dry soil and 40 percent slope. I sell lots of them to people who are looking for low maintenance, hardy plants for their summer cabins. Division is not necessary. New plants are most easily obtained from self sown seedlings.